Kauai is the oldest and northernmost of the developed Hawaiian Islands. 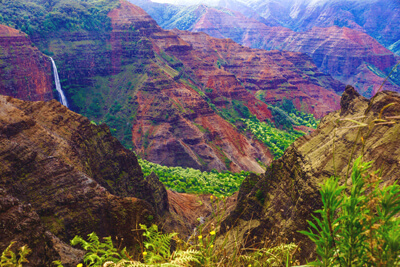 Waimea Canyon and the velvet-green cliffs of the Napali Coast are extraordinary geological features that make Kauai unique. This enchanting scenic drive offers hiking and discovery, blissful beaches, and a chance to experience the history, culture and flavor of the Garden Isle. Waimea Canyon, the “Grand Canyon of the Pacific”. Most visitors arrive in Lihue as it is home to the only commercial airport on Kauai. The Napali Coast is inaccessible by car making a loop drive impossible. We describe the scenic drive from Lihue heading east until the road ends, and then from Lihue heading west until that road ends. In Lihue, the Kauai Museum (M3) offers interesting insight to the history and culture of Hawaii. Exhibits explore the impact of indigenous and immigrant people on Kauai though artifacts, furniture, clothing, dioramas, art and photographs as you learn about Hawaiian royalty, the missionary era, plantation life, and more. Admission includes return visits within 7 days. Closed Sunday. At the Grove Farm Sugar Plantation Museum (M2) tour the historic plantation house and furnishings, worker’s quarters, and other outbuildings, as well as a collection of steam locomotives once used to haul cane. Then stroll the expansive gardens, and orchards. Knowledgeable docents lead two-hour guided tours (Monday, Wednesday and Thursday at 10 a.m. and 1 p.m., advance reservations required). Every second Thursday of the month, from 10 a.m. to 2 p.m. board a steam locomotive and ride through the plantation. There is a requested donation for entrance used for preservation and conservation of the site. Drive HI-56, the Kuhio Highway towards Kauai’s East Side, the Royal Coconut Coast. Lydgate State Beach Park (H6) is a popular family-friendly beach destination as a sheltered cove lets waves break gently towards the shore. Amenities include lifeguards, picnic areas, playground, camping, and access to a 2.5-mile paved path that connects Lydgate State Park to Wailua Beach, perfect for biking, jogging and strolling. Take time to observe the rock foundation of Hikinaakala Heiau and nearby petroglyphs. Immerse yourself in an emerald wonderland at Fern Grotto (A6). Foliage clings to the lava-rock and the surrounding landscape in a million shades of green. Access to this site is via guided boat or kayak tours only. Traditional live music performances resonate beautifully in the natural amphitheater of the grotto. Visit Wailua River State Park (H9) and marvel at the dramatic double cascade of Wailau Falls. The falls were featured in the television series Fantasy Island in case you’re getting that déja vù feeling. There is easy access from the parking area, but be patient as parking is limited. Hiking down is not recommended. Nearby, Opaekaa Falls tumble 151-feet over a basalt cliff, framed beautifully by lush vegetation. Rich in history, discover the archaeological sites of Poliahu Heiau, Kalaeokamanu Heiau, and Malae Heiau. Interpretive panels explain the cultural and religious significance of these sacred sites. Hike the Sleeping Giant Trail (H5), named for the summit of Mount Nounou which resembles a giant’s head. Splendorous 360-degree views await. The hike is a 4-mile roundtrip with an elevation gain of about 1,200-feet. Wear proper hiking shoes, bring water, and watch for steep drop offs. The highway continues passing a myriad of beaches, including Fuji Beach, Kapaa Beach Park, Kealia Beach, and Paliku Beach, also known as Donkey Beach. Stop as the whim takes you. Many can be accessed from the paved Kauai Multi-Use Path that skirts the coast, perfect if you explore by bicycle. Don’t miss the charming Donkey Beach Tree-Tunnel path to the beach. Though not recommended for swimming due to rough waves and strong currents, it offers premier wave-watching and sun-bathing. Protected by a reef and life-guarded, Anahola Beach Park (H4) is a safe swimming beach and popular for snorkeling and scuba-diving. Overnight camping with permit. The Anahola mountain range was featured in the opening sequence of Raiders of the Lost Ark. Don’t miss the unique favor of a Kauai Sugarloaf Pineapple grown at Hole in the Mountain Farm. The sweet, white flesh has a creamy texture. Find them at roadside stands, farmers markets, and grocery stores. Here the road curves towards the North Shore. Visit Na Aina Kai Botanical Gardens and Sculpture Park (A5) for a guided tour through a 240-acre horticultural wonder, from a formal garden, Japanese koi lagoon, international desert garden, and children’s garden. Tours are offered Tuesday-Friday. Prices vary depending on which tour you take and there is a ride tour for those who prefer not to, or are unable to walk. Kilauea Point National Wildlife Refuge (A8) is a stunning spot for views and wildlife watching. Bring your binoculars, or borrow some from the refuge to fully enjoy this bird-watching paradise. The refuge is home to some of the largest populations of nesting seabirds in Hawaii, including the endangered nēnē. Walk to the point and the Daniel K. Inouye Kilauea Lighthouse which was built in 1913. Tours of the lighthouse are offered Wednesday and Saturday. Knowledgeable docents share information about the history and wildlife conservation efforts, and you can walk up steep, narrow steps to the top. There is a day-use fee or use your America the Beautiful Pass. The Refuge is open Tuesday to Saturday. A dirt road, then a short but steep trail leads to Kauapea Beach (W3), also known as Secret Beach. Once here, bask along a wild and secluded 3,000-foot long golden beach. The surf is too strong for swimming but the scenery is well worth the effort. Anini Beach (W1) is one of the safest and most protected beaches along the North Shore. Spend the day here with the kids, or pack a romantic dinner picnic and cuddle up for captivating sunsets. Birders will love the Hanalei National Wildlife Refuge (A1) which conserves habitat for five endangered water birds, the Hawaiian goose, Hawaiian duck, Hawaiian coot, Hawaiian stilt, and Hawaiian moorhen, as well as 45 other species that rely on the Hanalei Valley for nesting and feeding. Bring binoculars, your camera, and drive down Ohiki Road or walk the trails. Entrance is free. Take the one-lane bridge to Hanalei. In town, you’ll find restaurants, art galleries, boutiques, and lodging. Built in 1892, the Hanalei Pier is beloved for fishing and gazing upon vivid sunsets, or sunrises. Just about the entire Hanalei Bay is rimmed with beaches. In mid-August, test your artistic skills by participating in the Hawaii Sand Festival and Sand Castle/Sculpture Contest which is free and open to all ages. Note, designs go way beyond filling a pail and turning it upside down. Back on Kuhio Highway, stop at the Waioli Huiia Church (A3). Built in 1912, the church features beautiful stained glass windows and is the most photographed building in Hanalei. Next door, step into Mission history at the Waioli Mission House (A4). Furnished as it was in the 1800’s, learn from informative docents who offer tours three days a week. Check the website for schedule. Picturesque Lumahai Beach (W2) was the sublime setting for the film South Pacific. Too rough for swimming, but revel in postcard-perfect views. With Mount Makana as a backdrop, Haena Beach Park (H1) offers life-guarded swimming, snorkeling, and surfing. Overnight camping with permit. Across the road is Maniniholo Dry Cave. Walk in and take photos. The National Tropical Botanical Garden preserves tropical plant diversity across the Hawaii Islands in five different locations. On Kauai are three of them. At the 17-acre Limahuli Gardens (A2) explore a vast collection of native plants, some rare and endangered species, flowers, and tropical fruits. On the South Shore, visit Allerton Garden (A7), where magnificent lush plants and trees were the background to scenes in Jurassic Park. Adjacent, is McBryde Garden, home to the largest off-site collection of native Hawaiian flora in existence. There is an entrance fee. Stroll on your own or book a guided tour. Sitting at the end of the road is Kee State Beach Park (H2). This popular life-guarded beach is sheltered by a reef and glorious for swimming and snorkeling, though note, in winter strong currents and rip tides can make for dangerous swimming conditions. Always heed beach warnings. Even if you don’t end up swimming, this is one of most beautiful places in Kauai. Along with simply jaw-dropping vistas, hikes that traverse the verdant Napali Coast begin here. The Napali Coast is a 17-mile stretch lined with 3,000-foot tall cliffs that are magically jagged and cozy at the same time, draped in velvety-green foliage. Inaccessible by car, you can hike or take a helicopter or boat tour to view this breathtaking landscape. Embark on a 4-mile roundtrip hike along the Kalalau Trail which heads to Hanakapiai Beach. It is moderately strenuous and requires you hike back up an elevation gain of 760-feet. Even if you don’t make it to the beach, the first mile will reward with phenomenal views. If you’re looking for an additional challenge, continue on the Kalalau Trail to Hanakapiai Falls, making it an 8-mile roundtrip hike back to Kee Beach. Start early, bring water, and wear proper hiking shoes. There are stream crossings. If water is high or running fast, do not cross. Only seasoned hikers prepared for a strenuous, dangerous multi-day adventure should hike the Kalalau Trail to Kalalau Beach, an 11-mile trek, one way. A permit is required and they sell out almost a year in advance, so plan ahead. The road ends here. Back track your way to Lihue. From Lihue we describe the rest of the drive heading along the South Coast. Poipu Beach Park (H10) is the most popular beach on the South Shore. Gentle waves and life-guards make for safe swimming, body-boarding, and snorkeling. Or head out further for surfing. Bask along a vast swath of golden sand with the chance to spot a monk seal, sit under a shady palm, or bring the kids to the playground. The Hanapepe Friday Night Festival and Art Walk is a must. Amid a friendly, lively, and casual atmosphere, stroll into art galleries and studios, meet local artists and craft-makers. There’s live music and plenty to eat with a bevy of eclectic food vendors, food trucks, and restaurants. While you’re here, cross the historic swinging bridge. Then pop over to the family-friendly Salt Pond Beach Park. On Kauai’s West Side, an epic daytrip awaits by taking the steep and winding Hwy-550 north up to Waimea Canyon (V1). Carved by the Waimea River, the “Grand Canyon of the Pacific”, is 10-miles long, 1-mile wide, and about 3,600-feet deep. Though smaller than its Southwest cousin, the rugged, multi-hued rock formations are visually similar. The first stop is the Waimea Canyon Lookout, or consider going all the way to Kokee State Park and make your stops on the way back. After the lookout, continue to Puu Hinahina Viewpoint. Here you’ll find the Waimea Canyon Trailhead and Spur Trail which leads to the Cliff Trail Lookout and Waipoo Falls Trail. Wear proper shoes for hiking, bring water, sunscreen and sunhat. Note, be sure to have a full tank of gas before heading up, and pick up some snacks at roadside stands as there are resplendent views that invite a picnic. Continue to Kokee Natural History Museum (M1). The small museum features informative exhibits, and you can get information on area hikes. Entrance is free, donations appreciated. Whether you hike or not, views at Kokee State Park (H3) are outstanding. Stop at the Kalalau and Puu O Kila Lookouts. From the latter, are a web of hiking trails through a paradise of lush vegetation, ethereal mist and clouds. The Awaawapuhi Trail leads to sweeping vistas of the Nu Alolo Valley and the Pacific Ocean. Drive back to HI-50. If you crave the challenge of a rocky, unpaved 5-mile road, don’t miss Polihale State Park (H11), the last beach on the west side. Here you’ll find an expansive beach with safe swimming at Queens Pond, solitude, dazzling sunsets, and camping with permit. Check your 4WD and car rental agreements beforehand, as driving to some areas, including this one, may not be permitted.